In 1991, German tourists discovered, in the Eastern Italian Alps, a human body that was later determined to be the oldest naturally preserved ice mummy, known as Otzi or the Iceman. Now, researchers reporting in the journal Current Biology on July 12 who have conducted the first in-depth analysis of the Iceman's stomach contents offer a rare glimpse of our ancestor's ancient dietary habits. 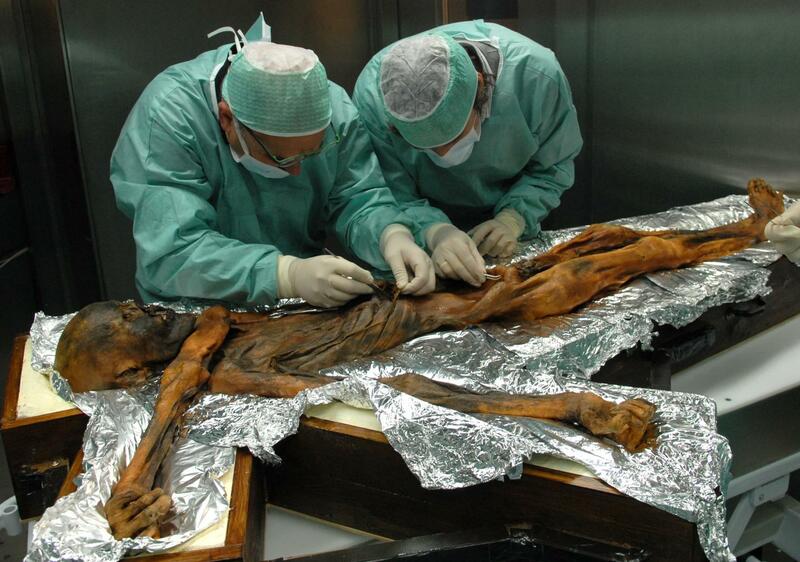 Among other things, their findings show that the Iceman's last meal was heavy on the fat. "By using a complementary multi-omics approach combined with microscopy, we reconstructed the Iceman's last meal, showing that he has had a remarkably high proportion of fat in his diet, supplemented with wild meat from ibex and red deer, cereals from einkorn, and with traces of toxic bracken," says Frank Maixner of the Eurac Research Institute for Mummy Studies in Bolzano, Italy. Bracken is a genus of large ferns. Maixner and colleagues, including Albert Zink, explains that the analysis hadn't happened earlier because scientists were initially unable to identify the Iceman's stomach. That's because it had moved up during the mummification process. In 2009, his stomach was spotted during a re-investigation of CT scans, and an effort to analyze its contents was launched. "The stomach material was, compared to previously analyzed lower intestine samples, extraordinarily well preserved, and it also contained large amounts of unique biomolecules such as lipids, which opened new methodological opportunities to address our questions about Otzi's diet," Maixner says. The researchers combined classical microscopic and modern molecular approaches to determine the exact composition of the Iceman's diet prior to his death. The broad-spectrum approach allowed them to make inferences based on ancient DNA, proteins, metabolites, and lipids. "The high and cold environment is particularly challenging for the human physiology and requires optimal nutrient supply to avoid rapid starvation and energy loss," says Albert Zink, also at the Eurac Research Institute for Mummy Studies. "The Iceman seemed to have been fully aware that fat represents an excellent energy source." The analysis indicated that the wild meat was eaten fresh or perhaps dried. While the presence of toxic bracken particles is more difficult to explain, the researchers say it's possible that the Iceman suffered from intestinal problems related to parasites found earlier in his gut and took the bracken as a medicine. On the other hand, he may have used the fern's leaves to wrap food and ingested toxic spores unintentionally. Their analysis also revealed traces of the original gut bacterial community present in the Iceman's intestinal contents. The researchers say they plan to conduct further studies aimed to reconstruct the ancient gut microbiomes of the Iceman and other mummified human remains. Funding for this research was provided by he Provincia Autonoma di Bolzano, the DFG Graduate School Human Development in Landscapes at Kiel University and the DFG Excellence Cluster Inflammation at Interfaces at Kiel University.